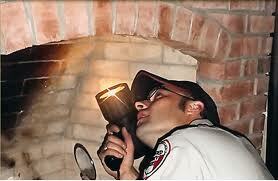 Chimney Wildlife Tech (832) 413-6431 can help you to fabricate custom flue caps Houston for your home and chimney. I like to plan ahead; I am one of those people who have a calendar of when the next time the air filters in my house need to be changed. It is no different with my fireplace, in fact, I like to get anything needed handled right around now in the year, that way if there is anything with my chimney that needs repairs I have time to get them done before I want to use my fireplace in the winter and can’t due to needing repairs this would include if I need flue caps Houston. I am also one of those people who like to get three quotes and don’t necessarily think that the lowest bid is going to get me the best product in the end. These are things that you don’t have to worry about with Chimney Wildlife Tech. Early on in our business we realized that the way that we could guarantee that our clients were getting the best possible product for their homes at the lowest cost to them was for us to make it ourselves. This then led us into getting our one metal shop set up where we only produce flue caps Houston along with other chimney related products. We use 24 gauge colored steel to make all of our flue caps Houston. By doing this we are ensuring not only the life of your chimney cap but also that the color won’t fade, peel or flake leaving you with an eye sore on your home. 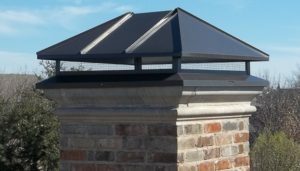 All of our flue caps Houston come with an animal guard installed so there is no way for birds, squirrels or any other animals to get into your home through your chimney, this also eliminates the risk of chimney fires as there is no nesting buildup. There are many functions that flue caps Houston performs to ensure the safe burning of fires in your home. With a chimney cap properly installed on your chimney you will be cutting down on water leaks into your chimney, not allowing animals in and also allowing the chimney to vent properly, taking smoke from the fireplace and letting it escape your home instead of filling your home when you have a fire burning. Another key function that flue caps Houston have is to protect the mortar crown of your chimney by keeping it blocked from the weather, water and heat. If this is not done the mortar crown and bricks on your chimney being to deteriorate, this then leads to further problems in your chimney along with the destruction of the chase, and in the case of a wood chase can lead to rotting, bad smells and the chimney not performing safely or well. If you have any question about the performance of flue caps Houston call Chimney Wildlife Tech (832) 413-6431 for an inspection.